A good friend called recently to share news of the wonderful celebration her family surprised her with for her 90th birthday. A well deserved celebration for a life well lived. For a woman who continues to live enthusiastically. One of my role models. Our conversation got me questioning how I am living today, whether I live with the same zest I so respect in my friend. And it sent me back to a remarkable book I have read twice now. Rules for Old Men Waiting, by Peter Pouncey, is the fictional story of an old historian and recent widower, who realizing that he is dying, compiles 10 rules by which to live his final days with as much dignity and intention as he can. Pouncey's old man, MacIver, is living alone in a cabin that has fallen into disarray and disrepair, as he himself has, while in the midst of overwhelming grief. So his rules, are, of necessity, very basic. "Keep personally clean. Make the bed every morning, and clean house twice a week. Dress warmly and light fire when necessary, burning least important things first. Eat regularly. Play music and read. Work every morning. Nap in the afternoon if needed." Eventually he refines his Rules for Winter Watch/Rules for the Inside Game and settles on writing a novel as his last piece of "work." And the result, a moving novel within a moving novel. I am not ill, not dying. But I am now 76, in the midst of the Age of Distinction as Michael Gurian describes this stage of life in The Wonder of Aging. ( I much prefer his term to "the old old" that many gerontologists now employ for my age group.) I want to live the rest of my life with as much dignity and intention as I can for as long as I can. If I make it to 90, I would like to be a role model for someone else behind me in the stream. 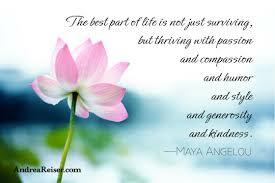 I want to thrive, not merely survive, with "passion and compassion and humor and style and generosity and kindness." Learn something every day - how to use the computer more effectively, something about aging, something about another country, current events (within mental health boundaries) - something. Simplify our home or life style in some way - reduce, reorganize, recycle, restrain. Prepare one vegetarian meal each day - alright, it's one step in the right direction. Read good literature every day. Spend at least 30 minutes outdoors each day. Do something special and enjoyable with John every day and make contact with one friend - thank heaven for e-mail. Move - as in walk. Find a way to laugh - laugh out loud. Spend at least 30 minutes a day on an activity that requires creative expression - writing, drawing, decorating. My work - to engage in an activity that contributes to someone other than myself - right now, that's this blog (hopefully this contributes to some folks), coaching, and some day, my own book. Now, I realize in reviewing this list that there are some things here that I already do with great regularity. I realize that there will be always be days I don't do all of these things, can't do all these things. There will be naps and movies and lunch with friends and catchup telephone calls. There will be doctors' visits and emergencies. There will be other options, others opportunities. In six months or a year, I may add something, delete something, or expand something. 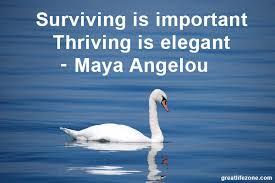 But for now, this feels appropriate, and doable and satisfying, a structure for thriving.